It is not unusual for you to feel bad when you go cycling and the dog is left alone at home. You are more at home with your thoughts than enjoying your bike trip. This is no longer necessary thanks to the KidsCab Cares for dogs dog bike trailers. Just take your best friend with you!. The KidsCab Cares for Dogs dog trailers are equipped with a suspension system for a comfortable ride. Inside, the bottom has a rubber coating, which is easy to clean. The bottom is reinforced to prevent sagging. To secure your dog we also added a leash. At the top the roof can be opened, so the dog can possibly stick their head out during the bike trips. Musquito net windows are present on all sides. That prevents to not get too hot during the summer months. A flag for more visibility should certainly not be missing. 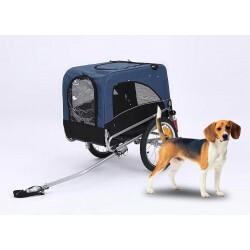 The KidsCab Cares for Dogs can be easily folded and fits in almost any trunk.